At Printerstock.com, we’re more than just paper. If you’re looking for cash register ribbons or other printer ribbon supplies, we have it. 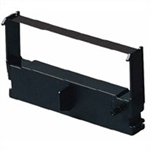 Find a wide selection of ink ribbons for Epson, NCR, Star, VeriFone models and more. Impact printer ribbon, which can generate both black and color images, are also available. Six long-lasting ribbons come in a case, so you’ll always have one on hand. With our extensive inventory, Printerstock.com will always be able to provide you with all your printer ribbon supply needs. Need help finding a ribbon for your printer model? Contact us at 866-748-8273.